Welcome to I am Face Doctor. Be my best little Face Doctor at the fancy clinic! Do you want to treat a Sorceress or an Primitive boy? Now you can achieve your dream to be a super kids face doctor! Wow, such a fantastic kids makeup game! Enjoy this lovely little face doctor game now! 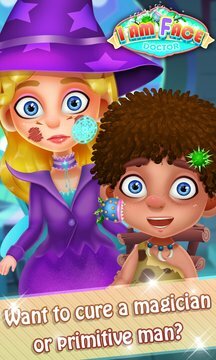 I am Face Doctor is a little doctor mania game, cute kids doctor game with makeup, and face doctor game just for kids! Look at the poor primitive boy! He suffered a fiery dragon just now... He is crying because of swelling and pain, do you want to cure him first, my dear little face doctor? And the adorable little girl! She likes painting. Er... her face is full of mud and colors! Doctor! Please help to clean her face and give her the most cute makeup. -- Take care of your adorable patients, don't be a crazy face doctor! Let's do it now, my dear little face doctor!